Each Mid-Atlantic tribe is unique in its cultural, economic, geographic, jurisdictional, social, and political identity. Currently, there are 27 state or federally recognized Tribal Nations in the Mid-Atlantic. Tribes in the region have relied on the ocean for thousands of years, and marine resources have been integral to their survival and their culture. Ten thousand years ago, the Mid-Atlantic coast looked much different than it does today. Depending on location along the coast, sea levels were 30 to 90 feet lower than they are today, exposing much of the continental shelf as dry land (Engelhart et al. 2011). Tribal peoples inhabited this vast area, using it for subsistence, ceremonial, and other customary uses. As sea levels rose, these areas have become submerged, but they are still recognized by Tribes as areas with cultural value. 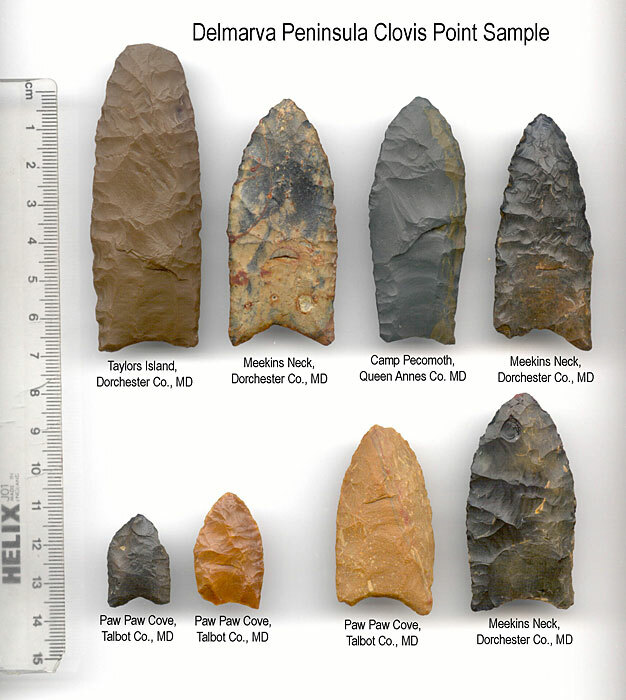 Paw Paw Cove in Maryland is considered by some to be “the best Paleo-Indian site in North America” (Blankenship 2007) and its discovery was archaeologically significant because it demonstrated that the Americas were populated thousands of years earlier than previously thought. Paw Paw Cove has the highest concentration of Clovis points in the world, dating to 13,000 years ago (Blankenship 2007). Other Mid-Atlantic Paleo-Indian sites with Clovis points include Cactus Hill in southern Virginia and Meadowcroft in western Pennsylvania. More than 350 Clovis points have been discovered on the Delmarva Peninsula (Blankenship 2007). Mapping submerged areas that are important to Tribes is a goal shared by many in the region. Tribes, academic institutions, and the Bureau of Ocean Energy Management (BOEM) are collaborating to develop protocols and best practices for identifying and mapping submerged paleocultural landscapes offshore (BOEM 2015d). Because of their long-term presence on Mid-Atlantic coasts, Tribes possess traditional ecological knowledge that complements modern scientific understanding of environmental status and trends. The collaborative project will develop case studies and best practices in using traditional ecological knowledge and modern science to characterize and study paleocultural landscapes. Traditionally, Mid-Atlantic tribal peoples used coastal waterways for travel and trade. Today, many Tribes in the region participate in a practice known as the canoe journey, which conveys knowledge of traditional navigation routes to younger generations, while fostering relations among neighboring coastal Tribes in the region. Along the canoe journey route, tribal ceremonies are held and blessings offered for the bounty and protection of the sea. Shellfish, migratory fish, and whales are all important resources to Mid-Atlantic Tribes for sustenance, trade, and/or spiritual reasons. Historically, whales provided Mid-Atlantic tribal people such as the Shinnecocks with food, raw materials, a source of spiritual and ceremonial strength, and valuable trade goods. Whales that beach on shore have great spiritual value. Every whale life given by hunt or drift is ceremonially thanked and blessed, and then processed for food and raw materials, such as bone. Today’s tribal fishermen use thousands of years of tradition, experience, and ocean stewardship practices for commercial and subsistence fishing. Tribes in the region have developed Fisheries Management Plans in collaboration with state and federal entities for co-management of resources and commercial industry regulation. Many Tribes continue to harvest shellfish in tribal waters, and some maintain shellfish and finfish hatcheries that are used to replenish and stock natural populations of important species. Tribal peoples use the shells of quahog, whelk, and conch in the region to create wampum beads, strings, collars, and belts (Wampum Trail Project 2015). Before Europeans used wampum as a currency in trade with native peoples, it served as an important element in Tribes’ cultural and political negotiations (Wampum Trail Project 2015). A project at the University of Pennsylvania is documenting and studying museum collections of wampum in order to better understand the ceremonialism, diplomacy, materiality, and artistry of wampum. Today, the traditions continue, and many Tribal members are employed as wampum makers. The Pamunkey Indian Tribe fish hatchery.